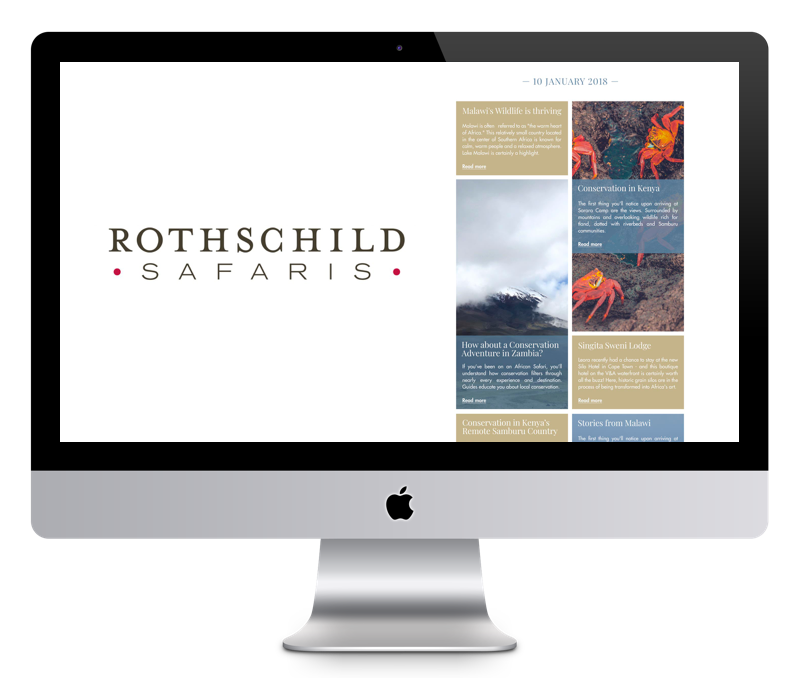 Rothschild Safaris are a tour operating business that manage safaris across Southern Africa, Australia and parts of South America. 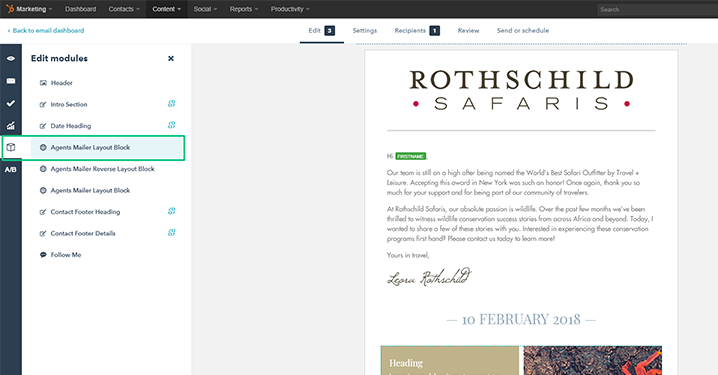 Rothschild Safaris approached MO Agency to create a HubSpot email template for their monthly mailer to their agents. 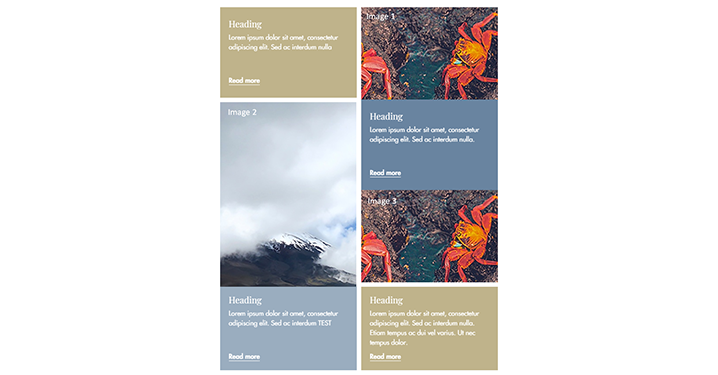 We received designs for the mailer, and our job was to code it for HubSpot. 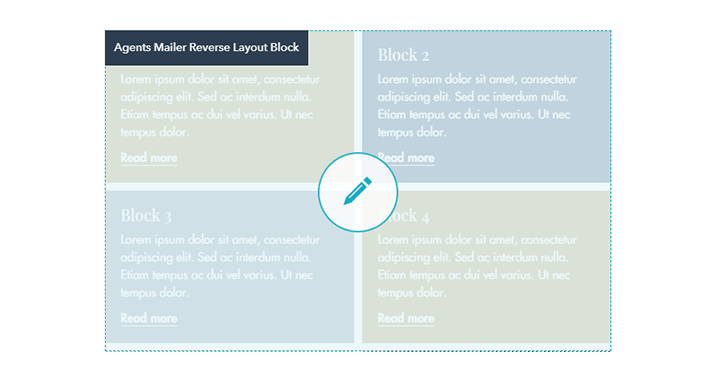 The monthly mailer was complex in that it displayed overlapping grids and the challenge was that every content block needed to be editable. The designs that we received needed to be tweaked in order to be coded for HubSpot, so we made the necessary changes which had minimal impact on the final layout of the mailer. 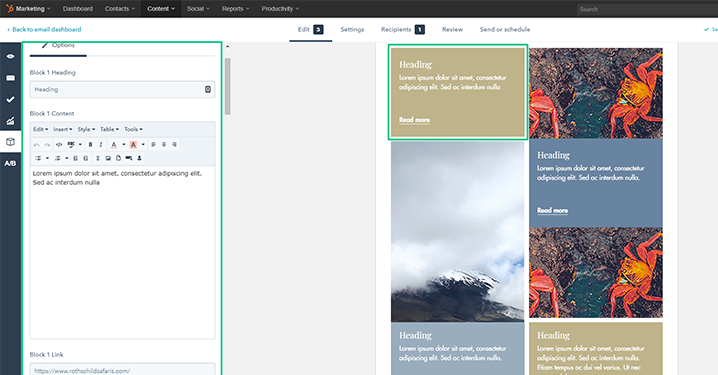 The intro module is a rich text module. It has a block of text that can be edited by selecting, deleting and adding text. The module already includes the personalization token for firstname (defaults to 'Traveler' if no first name is present). 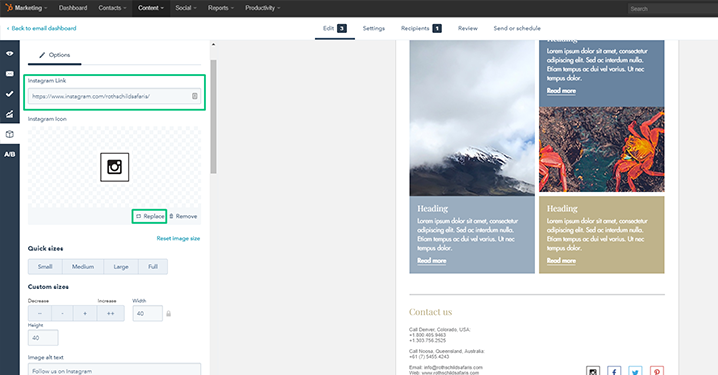 The company owners signature has been inserted as an image into the intro section content. This can be selected and removed if need be. Another signature can be inserted if required. 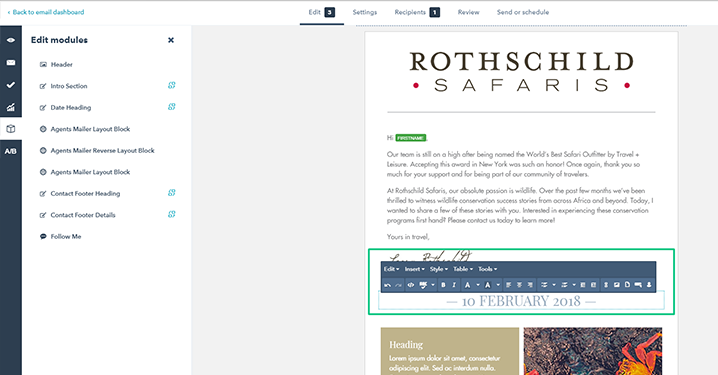 The date heading module is a rich text module. You can edit the date as you would in a normal text editor. The text you type in here will automatically be capitalized, centered, styled to the correct font colour and font family (PlayFair falling back to Times New Roman). To edit the first block on the left, you will see 4 fields prefixed with ‘Block 1’. 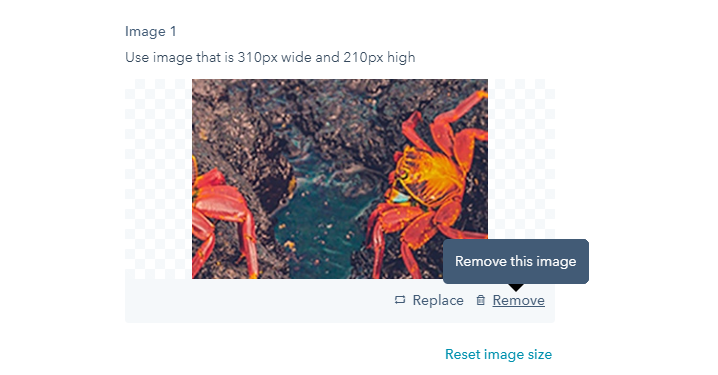 To replace the images, you will first need to click on ‘Replace’ on the image. 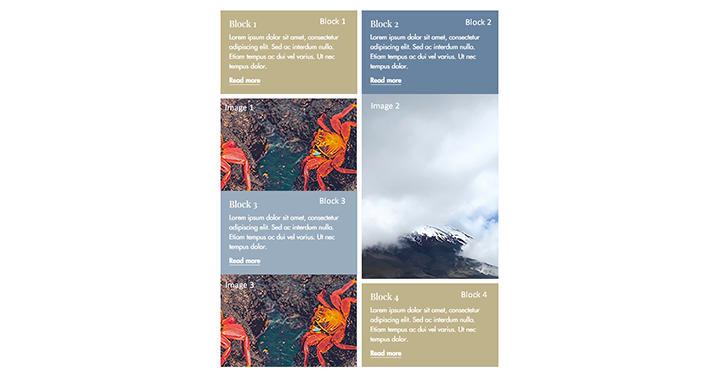 Again, each image editor has clear instructions on the pixel sizes of the images for each section - images 1 and 3 need to be 310px wide and 210px high and image 2 needs to be 310px wide and 420px high. This is a rich text field. 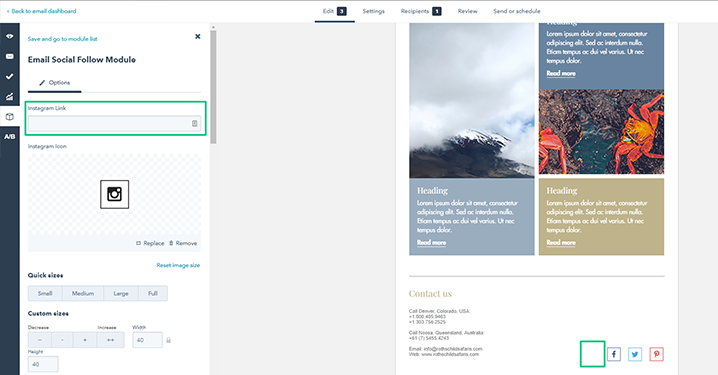 You can edit the text of the heading in the footer if need be. This is a rich text field. 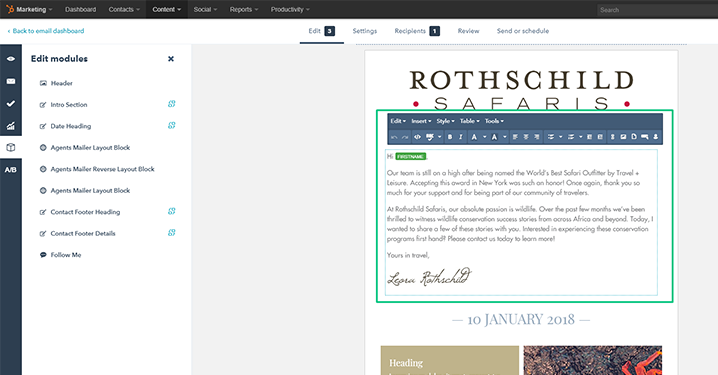 You can edit the text of the footer content in the footer if need be (if the phone numbers or email address changes, or if you need to add another office to the footer). 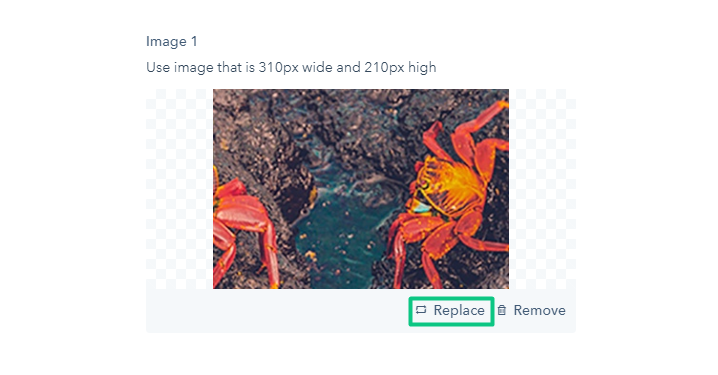 For each social media, you can change the link in the field with the suffix ‘Link’ and by clicking on replace image, you can change the image of the icon.